Check in time is 15:00 and Check out time is 12:00. We try our best to make sure as many reservations as possible get a sea view, however during busy periods this is not always possible. Payment is due on arrival. The property reserves the right to pre-authorize credit cards prior to arrival. Cancellation policy: up to 48 hours before arrival date and official check in time no fee will be charged. Otherwise the first night will be charged. For any changes or cancellation of a reservation for 7 days or more or with 2 rooms or more we need to be notified 7 days in advanced. Otherwise the first night will be charged. In case of no show the entire amount will be charged. -All rooms are with air-condition, 32 inch flat screen cable TV, free WI-FI and a refrigerator. -Unlimited supply of beach towels , free coffee/tea complementary throughout the day. -Our friendly staff will be happy to help you with finding pubs, clubs, book tours, connect you to water sports opportunities and other hot spots in Tel Aviv. 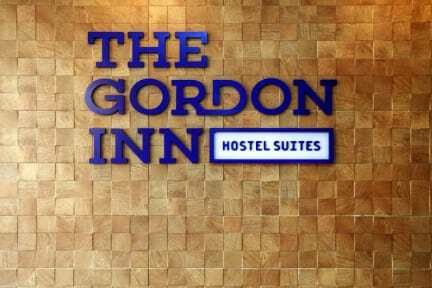 The Gordon Inn Suits is the leading hostel in Tel Aviv, Israel. We provide a warm and family-like environment, so our guests will feel at home away from home. The professional and friendly staffs are highly knowledgeable about Tel Aviv, Israel and its many special attractions. Along with a restaurant, this property has a fitness center and a lounge. Free continental breakfast and free WiFi provided. Additionally, a business center, a meeting room, and a 24-hour front desk are onsite to help you with anything you need including various daily tours in the city/country. Tel Aviv is the perfect place for people who like to eat out, or simply grab something on the go. It is a city that offers a wide variety of food items, from fancy gourmet restaurants, to simple, but tasty fast food. For those who appreciate good quality and fresh food products, Tel Aviv offers restaurants in almost all the styles of the world. From typical Jewish and Middle Eastern food, to Asian, Indian, French, North African, North/South American and European cuisines. All beautifully designed rooms & suits provide fully equipped kitchenettes with refrigerators and air conditioner, plus free WiFi and flat-screen TVs with satellite channels. Guests will also find coffee makers, showers, and desks. Limited housekeeping is available. Our dorm rooms are fitted with bunk or single beds. You have access to the kitchen, free WiFi and breakfast included as well. Payment upon arrival by cash, credit cards, debit cards. This property may pre-authorize your card before arrival. Breakfast is available for 12$ per person. I would totally recommend this hostel. It is located right next to the beach and in front of it there is a bus stop from where you can take buses for anywhere. The hostel is extremely clean and the staff is always very polite and willing to help. Really lovely place, great location, beautifully done up and very nice breakfast. My only gripe was the padlock things on the lockers in my dorm had been put on the wrong way round so anybody could unscrew them and open. The person I told didn't seem to care but I think I just didn't talk to the right person. The hostel in general seems secure, just the locker in my dorm room was an issue. I was greeted warmly and directed to my dorm which was clean, cosy and very welcoming. The dorm breakfast at the café downstairs and is very good value; other options are available - I can recommend the shakshuka! The staff were very helpful with all my queries, regarding bus travel, pharmacy nearby, any tours. A couple of blocks inland, you miss the beachfront traffic and you're on the route for many local bus services including to and from central station for the Airport. Great base for exploring Tel Aviv and Israel. The staff were so helpful and friendly, they gave me really good advice and the tours they recommended were excellent. Loved the breakfast which you can have at almost any time of the day. Nice common area and balcony. It was a bonus to have a fridge, sink and kettle in the dorm room. I booked a 5 bed dorm ensuite but this was shared with the adjacent dorm so there were sometimes a bit of a wait for the bathroom. Beds very comfy and clean. Bathrooms very clean. Staff very helpful. Good central location. Good selection for Breakfast in nextdoor cafe using voucher. Great value for money. Generally a lovely hostel. Staff are very friendly and location is great. However, I was in the female dorm and the aircon over night didn't work. In the Israeli summer and locked up with 5 other girls - this wasn't pleasant. Also since you are staying on a very main road, it can be very noisy in the very early morning. But in general. Great hostel but maybe better in the winter months. More of a hotel style vibe, great for if you just want a bed for a night but they don't really build a community. Maybe some events on the new downstairs bar might create this. We stayed at GIS on 03/02/18. Staff were lovely&overall helpful. Room was terrible. It backed onto busy road and traffic noise and reverberations were constant ALL night. Earplugs we useless as it felt like our bed was on the road itself. The kitchen and bathroom area were in a horrific state when we arrived with peanut butter and dirty dishes strewn everywhere and piles of wet towels on the bathroom floor. Certainly not what we expected after paying £55/night. Sincerely disappointed. The hostel itself was not bad but I felt it had no atmosphere. In addition I had payed for a 5 person dorm with a bathroom but was put in a 10 person dorm because the structure of the rooms was not advertised properly. Lastly, they never bothered to allocate beds so I was split from the people I was travelling when we had paid to have a room together. I just found the place super dogdy and felt ripped off afterwards. I would not stay here again.